Due to popular demand, for the fourth straight year we have expanded our A-A team to a “full roster” of twelve players for this season! TGS PLAYER OF THE YEAR: Jarrett Culver, Texas Tech... No, we’re not obligated to follow the crowd and bestow more honors upon Duke’s Zion Williamson. Besides, we awarded Zion our Newcomer of the Year in our last issue, and included a detailed critique of the explosive and colorful yet insanely overhyped Williamson in the process. None of the extra hype applies to the smooth Culver, who emerged as the go-to option for a Red Raiders side that progressed to the national title game. We knew Culver was pretty good after scoring better than 11 ppg last season as a frosh, but his seamless transition to the go-to option for Tech after the departure of key G Keenan Evans was a significant catalyst to the best season they’ve ever seen in Lubbock. The Red Raiders played thru Culver, a projected NBA draft first-round pick who demands extra defenders and opens the floor for his teammates. The 6-6 Culver was also of great value to Chris Beard’s snarling defense with his length that proved quite unnerving for foes on the perimeter. TGS COACH OF THE YEAR: Chris Beard, Texas Tech... We might as well make it a clean sweep of our awards for the Red Raiders, with Beard a very deserving recipient of any Coach of the Year honors. It’s been a meteoric rise, but we can’t say we’re surprised, as Beard has won everywhere he’s coached, including his last stop at Little Rock, reviving a dormant Trojans program and leading them into the second round of the Dance three years ago. As a hot commodity in 2016, Beard immediately landed the gig at UNLV. But even though the Rebs were bound to eventually lose Beard, they didn’t think he’d be gone in less than three weeks when the Texas Tech job opened. Desirous to live near his children in Lubbock, the move was a no-brainer, with UNLV wishing it had a bigger buyout in its original deal for Beard. His hire turned out to be the best thing that ever happened to the Red Raiders, who knew a thing or two about Beard from his previous stint as an assistant on Bob Knight’s staff more than a decade ago. The Knight connection is easy to identify on the court, as Beard’s team plays defense in the same, no-holds barred style of Knight, tenacious on the ball, clogging the middle, and forcing teams to the baseline where there is less room, as well as a Knight-like motion-based, screen-oriented offense. At the rim, there’s 6-10 protector Tariq Owens playing the role of an NHL goalie. Combined with length and athleticism, and Beard’s shrewd maneuvers in the grad transfer market (Owens from St. John’s and G Matt Mooney from South Dakota), it became a historic season in Lubbock, where the stars have finally aligned on the hoops side. HONORABLE MENTION: Kelvin Sampson, Houston... Sampson’s career seemed doomed a bit more than a decade ago after he was run out of Indiana for a boatload of violations, a reputation that had followed Sampson throughout previous career stops at Washington State and Oklahoma. A couple of NBA assistant gigs with the Bucks and Rockets were proper penance for Sampson, whose reputation was re-habbed somewhat by that journey through the pro ranks. By 2014 and beyond the five-year show-cause penalty from the NCAA, Sampson landed back in the college ranks at Houston, a once-proud program whose star had fallen. Sampson has propped up the Cougars once more, a late buzzer-beater by Michigan away from a spot in the Sweet 16 a year ago, and, after some key graduation losses, re-booting quickly this season and reaching that Sweet 16 level before a late-minute loss, following a gallant rally, vs. Kentucky. Expected to be on the radar for some power conference openings (Arkansas mentioned prominently, plus the expected opening at LSU), Sampson has instead re-upped with a pricey 6-year extension from UH, whose boosters have decided they’re willing to spend big money (look how the Cougs lured Dana Holgorsen from West Virginia on the football side!). As a bonus for Sampson, son Kellen has been named coach-in-waiting, though Kellen might have to wait a bit, as the deal for dad runs thru the 2024-25 season. Bruce Pearl, Auburn... While we have always been entertained by Pearl and have enjoyed watching the exciting style of his teams, we have known the other side of the coin from this fast-talker, who has walked (crossed?) the fine edge of ethics many times in his checkered career. (Our skepticism of Pearl dates back to the early ‘80s and his days on the Dr. Tom Davis staff at Stanford, when we know many in and around the program loathed Pearl). But the man can coach and this season’s Auburn, cruelly denied a spot in the title game after a last-second foul by Samir Doughty on Virginia’s Kyle Guy, was a refreshing change from the other grinding, defense-first sides in the Final Four. Pearl’s team instead preferred to get as many possessions as possible as it tried to dictate tempo with a fast, exciting pace. Crackling guards Jared Harper and Bryce Brown made the Tiger engine go. In the end, we were a bit sad we didn’t get to see what would have been a fascinating tactical battle vs. Texas Tech in the title game, but Pearl’s status as a top-flight coach was confirmed. Whether it’s the last we hear for a while of Auburn, or perhaps Pearl, after the Tigers have been identified in the recent recruiting scandals (and assistant Chuck Person pleading guilty to charges), remains to be seen. Whatever, Pearl’s Auburn was sure fun to watch this season! Other honorable mentions (in no particular order): Johnny Dawkins, UCF; Nate Oats, Buffalo; Buzz Williams, Virginia Tech; Rick Barnes, Tennessee; Dana Altman, Oregon; Ritchie McKay, Liberty; Russell Turner, UC Irvine; Tom Izzo, Michigan State, Dave Leitao, DePaul; James Jones, Yale; Tom Young, Wofford; Shaka Smart, Texas; Matt Figger, Austin Peay; Craig Smith, Utah State; Matt Langel, Colgate; Randy Bennett, Saint Mary’s; Rick Byrd, Belmont; Tim Craft, Gardner Webb; Kermit Davis, Ole Miss; Chris Jans, New Mexico State; Michael Huger, Bowling Green; Fran Dunphy, Temple; Bill Coen, Northeastern; Keith Dambrot, Duquesne; Matt Painter, Purdue; Brett Reed, Lehigh; Casey Alexander, Lipscomb; Mark Schmidt, St. Bonaventure; Gregg Marshall, Wichita State; Darian DeVries, Drake; Travis Steele, Xavier; Mike Rhoades, VCU; Doc Sadler, Southern Miss; Joe Mihalic, Hofstra; Jeff Boals, Stony Brook; Mark Few, Gonzaga; Greg Herenda, Fairleigh Dickinson; Chris Holtmann, Ohio State; Mike Hopkins, Washington; Derrin Hansen, Omaha; Todd Simon, Southern Utah; Tim Cluess, Iona; John Becker, Vermont; Penny Hardaway, Memphis; Bruce Weber, Kansas State; Tony Bennett, Virginia; John Calipari, Kentucky; Ray Harper, Jacksonville State; Jeremy Ballard, FIU; Matt McMahon, Murray State; Brian Gregory, South Florida; Keno Davis, Central Michigan; Kyle Smith, San Francisco. Most likely to be Subpoenaed by the FBI (Dishonorable Mention): Michael Avenatti...The controversial attorney, better known for his tabloid-friendly law practice, countless TV appearances on the behalf of former client Stormy Daniels, not to mention various transgressions, charges, and judgments that have brought his professional reputation into disrepute, nonetheless looms as a potential transformational figure in the ongoing coaching/recruiting scandal that threatens to shake college hoops (and the coaching and shoe industries) to the core. More specifically, Avenatti says he has the goods on Nike, which many insiders have long believed was doing the same sorts of under-the-table things that got the Adidas connections previously fingered and charged by the FBI. We’ll see where all of this goes, as Avenatti hardly fits the profile of a reputable witness. The national sports media has, for the most part, decided to side with Coach K and others who are in the Avenatti line-of-fire, and already opted to dismiss Avenatti and look the other way...which might be a mistake. This reminds more than a bit of their similar treatment of Jose Canseco, the discredited former ballplayer who nonetheless accurately fingered many of the transgressors in the MLB steroid controversy of a few years ago. Much of what Canseco said turned out to be true about the abuse of performance-enhancers; will Avenatti eventually prove to be similarly on the mark with his allegations? A lot will be at stake, especially in the coaching and shoe communities, if Avenatti’s charges have some legs. Stay tuned for upcoming court dates and related activities. Another overlooked collection that we at TGS also believe warrants some extra attention, hence another expanded grouping... two teams worth, a full 24 honorees! MID-MAJOR PLAYER OF THE YEAR: Jordan Caroline, Nevada...Tough call here, as Murray State’s Ja Morant will almost surely be the first mid-major taken in the upcoming NBA Draft. By us, however, we have to make room for Caroline, who laid it on the line on both ends of the court while spearheading a Nevada revival under HC Eric Musselman (who moved to Arkansas over the weekend). The Wolf Pack was ten years between Big Dance appearances until Caroline showed up as one of Musselman’s first of the Reno transfer brigade in 2016-17. A warrior on both ends of the court, the former Southern Illinois transfer immediately became the engine for the Nevada resurgence as the Pack qualified for the Dance each of his three seasons. Along the way, Caroline worked to hone his game, developing a dangerous three-point jumper along with a knack for driving the ball into the paint, making him an almost impossible matchup for Nevada foes. Caroline worked just as hard on the boards and on defense, which might have been the reason he finally began to wear down a bit late in the just-completed season. That’s because there was no player in the country that left it all on the floor each night, on both ends of the court, as did Caroline, whose family tree suggests he might switch sports into the NFL for a pro career (his dad is former Pro Bowl LB Simeon Rice, and grandpa is long-ago Chicago Bears star DB J.C. Caroline). An often-overlooked category, these workhorses are deserving of their own special honors. TGS DEFENSIVE PLAYER OF THE YEAR: Matisse Thybulle, Washington...If there is one player from the above list that is most likely to make his mark on the next level because of his defense, it’s probably Washington’s Thybulle. Though some of the bigs (such as Oregon’s Wooten and Texas Tech’s Owens) are shot-blockers deluxe, the athletic Thybulle (with a 7-1 wingspan) seems equipped to handle the more difficult assignment of sticking on the dangerous and more versatile perimeter scorers at the next level. 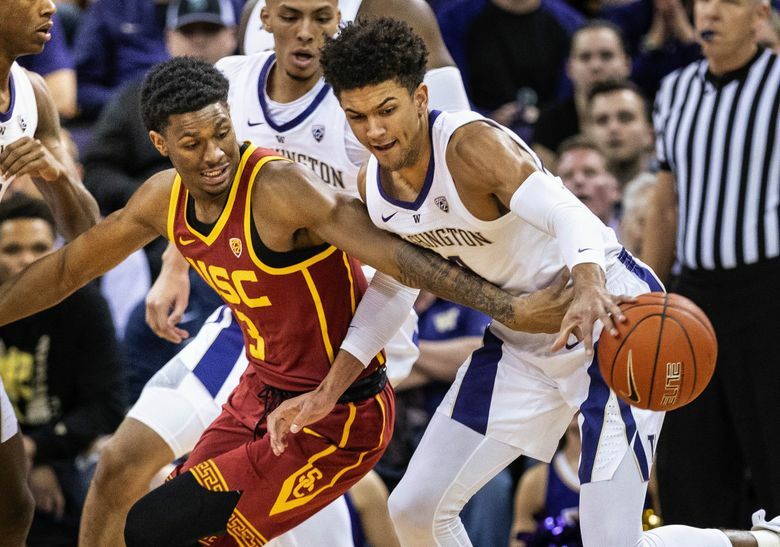 Though working mostly within the Mike Hopkins zone defense at Washington, Thybulle had already established himself as a defensive menace during the preceding Lorenzo Romar regime. His combination of length and athleticism should allow him to stick at the next level. He also led the nation in steals with 126, and is the first two-time Pac-10/12 DPOY since Gary Payton! DISAPPOINTING TEAM OF THE SEASON: UCLA...We could have nominated almost half of the Pac-12 for this honor, but a special place is reserved for the Bruins, who were ranked in the Top 25 in most preseason polls but never remotely approached those projections. Early on it was apparent that this Westwood edition had no taste for defense or any dirty work, which didn’t seem to outwardly bother HC Steve Alford, who instead, in lukewarm fashion, questioned the effort of his team and seemed to be daring HC Dan Guerrero to fire him due to indifference. Four straight losses in later December, capped by a humbling setback at Pauley Pavilion to Atlantic Sun Liberty on December 29, proved the final straw as Guerrero canned Alford on New Year’s Eve. The Bruins would then turn to interim Murry Bartow, who, in an ironic twist, became the temporary coach at the school where his dad “Clean Gene” had once coached, but had become so exasperated and disillusioned with the fan base and environment (maybe to be expected after following John Wooden) that he bolted for a start-up job at UAB following the 1976-77 season. But the team never showed much consistency for Bartow, either, and in the end, UCLA finished an uninspiring 17-16, as avoiding a losing record was about the only accomplishment of the season. Alford thus became the first in-season coaching casualty in Bruins history (Jim Harrick, if you recall, was dismissed just before the beginning of the 1996-97 campaign). The subsequent search for a new coach, which ostensibly began the day Alford walked the plank, was ongoing into this week, as countless high-profile coaches either expressed no interest in the once-pristine Bruins job, or used it as leverage for a better contract at their current schools (read John Calipari at Kentucky, and what recent target Rick Barnes might be doing with Tennessee). The bar has never been set so low in Westwood; how the mighty have fallen! 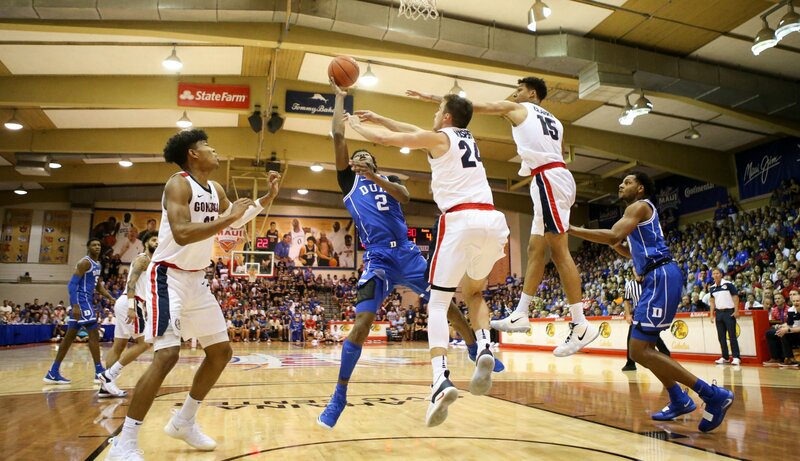 TGS GAME OF THE YEAR: Gonzaga 89 - Duke 87, Maui Classic final on November 21...The thought of a Final Four rematch of the championship game in Maui had college hoops fans excited all season. It didn’t materialize, but the memory of the raucous battle in Lahaina during Thanksgiving week would remain as something of a high-water mark for the entire season. The Blue Devils fell behind by double digits before getting in gear in the second half, when frosh stars RJ Barrett (23 points) and Zion Williamson (22 points) turned up the volume, but Duke’s defense was picked apart all night by Mark Few’s well-oiled offense, which hit almost 53% from the floor and led by F Rui Hachimura’s 20 points. It was a breathless encounter that left TV watchers limp, and we can’t recall a more exciting battle the remaining 4½ months of the season. POINTSPREAD CHAMP: Drake (24-8). Other spread champs...CS Northridge 23-8, Ole Miss 23-10, Michigan State 27-12, Virginia 26-12, Central Michigan 20-12, Oklahoma 20-12, UT Arlington 20-12, UCF 20-12. POINTSPREAD CHUMP: North Texas (9-21). Other spread chumps... Cal Poly SLO 9-18, Ohio 10-20, Wyoming 10-20, CS Fullerton 11-21, Vanderbilt 11-21, Valparaiso 11-20, Arkansas State 11-19, West Virginia 13-22, Little Rock 11-18, UC Davis 11-18.